The α6300 is the flagship APS-C mirrorless interchangeable-lens camera from Sony featuring the world's fastest1 0.051-s AF with the most2 phase-detection AF points (4252), Exmor® CMOS sensor with 24.2 effective megapixels3, extra-wide ISO 100-512004 sensitivity range, enhanced 4K movie recording, and XGA OLED Tru-Finder™. The new 24.2 MP3 Exmor® CMOS sensor raises the bar of imaging performance. Its copper wiring and enhanced circuitry make it possible to lower the wiring layer and boost light collection efficiency, in order to capture low-noise images with a wide sensitivity range up to ISO 512004. The use of copper raises readout speed as well as the potential of advanced 4K and Full HD 120fps shooting. How do the superior speed, power and efficiency of the BIONZ X™ image processor unleash the potential and sensitivity of the new image sensor With an algorithm optimized for the new image sensor to provide stills and movies with unrivaled resolution and reproduce greater texture and detail, particularly at mid-to-high ISO settings. With the world's most2 (425)2 focal plane phase-detection AF points helping to provide distinctively wide and dense AF point coverage, the α6300 focuses more accurately, efficiently, and reliably on subjects throughout the frame. 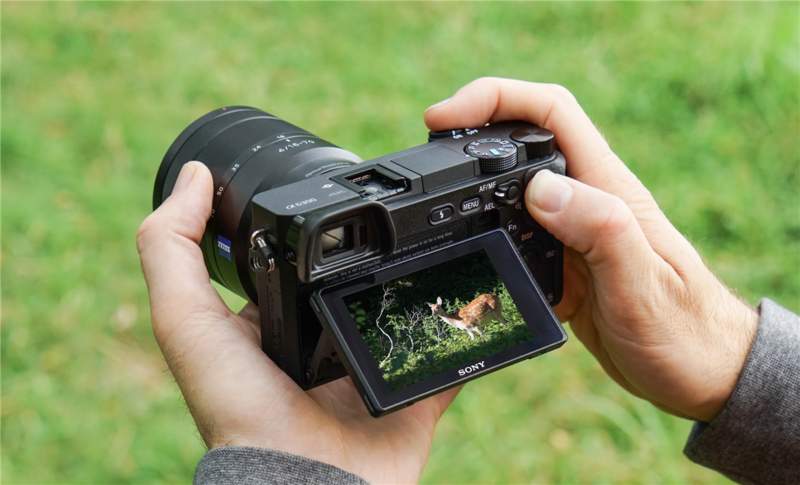 The α6300 achieves the world's fastest1 (0.05 s1) AF speed with the enhanced Fast Hybrid AF's integrated autofocusing performance and the uncanny efficiency of the BIONZ X™ image processing engine to handle so much information with astonishing accuracy. The α6300 offers focal plane phase-detection AF even when an A-mount lens5 is mounted using a mount adapter (LA-EA3) from Sony. So you can take advantage of the autofocus system's uniquely wide coverage provided by 425 focal plane phase-detection AF points, as well as fast, fluidtracking performance when shooting with other lenses as well as E-mount lenses. 4K movie recording in the Super 35 mm7 format with full pixel readout and no pixel binning allows about 2.4 times8 as much information as is basically required for 4K (QFHD: 3840 x 2160). Data this rich is, in fact, equivalent to 6K data, so it clearly conveys the ultimate resolution in 4K images. You can shoot high-quality Full HD9 footage, even in Full HD 120fps (100fps) high-speed shooting with AF tracking at a high bitrate up to 100 Mbps. Otherwise, the camera can record 4x/5x slow motion movies internally when the frame rate is set at 30p (25p) or 24p. S-Gamut/S-Log shooting give you flexibility to make more expressive movies by performing color grading in post-production. The S-Log3 and S-Log2 gamma curves feature wide dynamic range (up to 1300%) to minimize whiteout and blackout. The α6300 even offers impressive 14-stop latitude in S-Log3 gamma setting.The camera also supports S-Gamut, S-Gamut3, and S-Gamut3. Cine color space from Sony. *S-Log2 and S-Log3 are premised on processing pictures. One-touch remote makes your smartphone or tablet a viewfinder/remote control. One-touch sharing transfers photos/videos to your device for social network site (SNS) sharing. Just install an Imaging Edge Mobile app10 via Wi-Fi on your NFC-enabled Android device, then touch the device to the camera to connect them. No NFC No problem. New QR code compatibility can also pair the devices. Fast Hybrid AF makes movie autofocus exceptionally precise, so it's especially valuable for 4Krecording. In addition to a very dense phase-detection AF point array, this system in the α6300 features adjustable AF Drive Speed and AF Tracking Sensitivity to help you express more creativity by manipulating focus, as far as conditions and your imagination allow. This function supports 4K and Full HD9, and allows uncompressed movies to be output to an external recorder or monitor. The image can also be recorded in the camera11 even while signals are output using this function. ade tyo, Kuta, Badung Regency, Bali, Indonesia: i bought this camera a month ago and this is one of best low light camera, i am very happy with the result. footnote1 Among interchangeable-lens digital cameras as of February 2016, based on Sony research. Measured using CIPA-compliant guidelines, and internal measurement method with an E PZ 16-50 mm F3.5-5.6 OSS lens mounted, Pre-AF off and viewfinder in use. 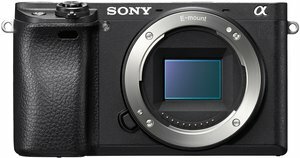 footnote2 Among digital cameras as of February 2016, based on Sony research. footnote4 Up to ISO 51200 for expanded ISO range for stills. Up to ISO 25600 for movies. footnote5 A-mount lenses with SSM or SAM only. You can choose phase-detection AF or contrast-detection AF in AF System menu. footnote7 At 24p (25p) recording. footnote8 About 1.6 times at 30p recording. footnote9 Pixels to be read are limited to the sensor area that is required for Full HD movies. footnote10 A successor application of PlayMemories Mobile™. Existing PlayMemories Mobile users can use this by updating PlayMemories Mobile. footnote11 Image will not be displayed on the camera’s LCD screen during 4K movie recording. footnote12 Gamma Display Assist is not available for monitoring on external displays and television sets. footnote13 This camera is designed for optimal dust and moisture resistance, but is not waterproof or splashproof. For FE lenses only. footnote14 Requires a valid Sony Entertainment Network account. Some apps require a fee. Availability of PlayMemories Camera Apps and each app varies according to country or region. footnote15 Please contact Phase One regarding all inquiries as to usage and support including functional compatibility of Capture One Express (for Sony) and Capture One Pro (for Sony). footnote16 Final Cut Pro, iMovie, and Mac® are trademarks of Apple Inc., registered in the U.S. and other countries. The Mac logo is a trademark of Apple Inc.
footnote18 LA-EA3 is sold separately. footnote19 With compatible external flash. footnote20 Approximate. may vary depending on shooting conditions and media. © 2016 Sony Electronics Inc. All rights reserved. Reproduction in whole or in part without written permission is prohibited. Sony is not responsible for typographical and photographic errors. Features and specifications are subject to change without notice. Sony, BIONZ X, Exmor, PlayMemories Home, PlayMemories Mobile, PlayMemories Camera Apps, PlayMemories Online, Xtra Fine LCD, the Alpha logo and the Sony logo are trademark of Sony Corporation. AVCHD™ is a trademark of Panasonic Corporation and Sony Corporation. Windows is a trademark of Microsoft Corporation. Mac OS and iMovie are trademarks of Apple Computers, Inc. HDMI are a trademark of HDMI Licensing LLC. All other trademarks are trademarks of their respective owners. The Sony A6300 delivers class-leading photo and video quality, plus good performance and features for shooting action. Myriad small annoyances mar the experience and it has the trademark poor battery life of Sony's A series. Plus it really could use in-body image stabilization. 8.3 OVERALL The overall rating is 8.3 out of 10. Design 8.0 out of 10 Design rating is 8.0 out of 10. Features 8.0 out of 10 Features rating is 8.0 out of 10. Image quality 9.0 out of 10 Image quality rating is 9.0 out of 10.